Born on the farm, near Cairo, Georgia, where his great-granddad was a sharecropper, Hershell Norwood migrated north with his family as a young child and started school in Orange, New Jersey. After one year of high school, he got a scholarship to Hampton School, a boarding school in New Hampshire. He excelled at football and moved on to Tufts University, near Boston. "I played quarterback in high school and running back in college," he says, "and got a degree in theater." He began work on an MFA in acting at Brandeis in the late 70s, then spent a decade selling ad time on NBC Boston. "I did some talent work, acted in programs and TV commercials," he says. "I finished my MFA in 1990. I wanted to pursue a PhD." He taught at a junior college in Newark NJ and at Virginia State in Petersburg, and pursued the PhD at Tufts, at the U of Maryland, and at Texas Tech, where he wound up with a master's in playwriting. 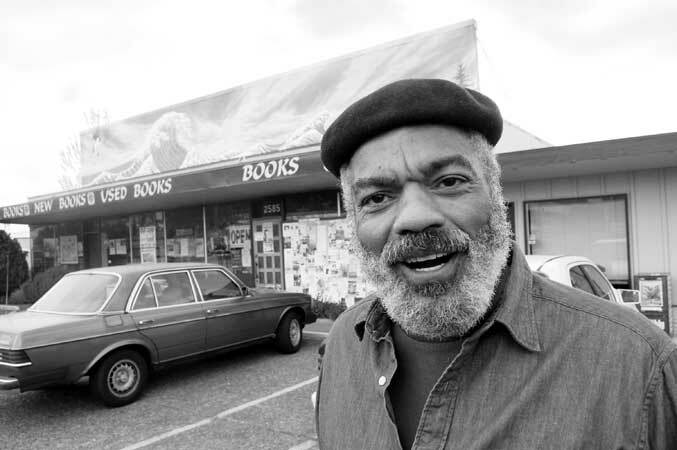 Since moving to Eugene in 2009, he has acted in local productions and spent his time writing, working on six plays and a book on African American theater. "Ultimately, I'm a playwright," he says. Norwood's newest play, Fell the Tallest Tree, Judgment of Paul Robeson, celebrated its world premiere as part of the Tsunami Books Play Reading Series on May 2nd. The cast featured LCC professor Stanley Coleman as singer, actor, and activist Paul Robeson. The story envisions Robeson's death-bed recollections, from Jazz Age fame to Red Scare era persecution. Paperback copies of the play are available for purchase at Tsunami Books.